I think it’s just about time for another series of random food stories that have little other connection save the title of this blog: they are Eats that One (that one being me) Ate. Somewhere. Sometime. Not necessarily from an event or road trip but still tasty (or at least interesting) enough to warrant a mention. A year or so ago I wrote about the myriad of breakfast options One can find in West Point, Mississippi. At the time I was passing through there a good bit on my way to work in Aberdeen, and it was usually around breakfast time when I hit the city limits. A few weeks ago I happened to be there early in the day and saw a sign for Jubilations Coffee House. I knew Jubilations from their famous cheesecakes, so I was intrigued by what breakfast selections they might offer. Upon first walking in, you face a long window that looks into the cheesecake-making facility, so to speak, where on one visit I got to watch the nice cheesecake man send some famous cheesecakes through the slicer. 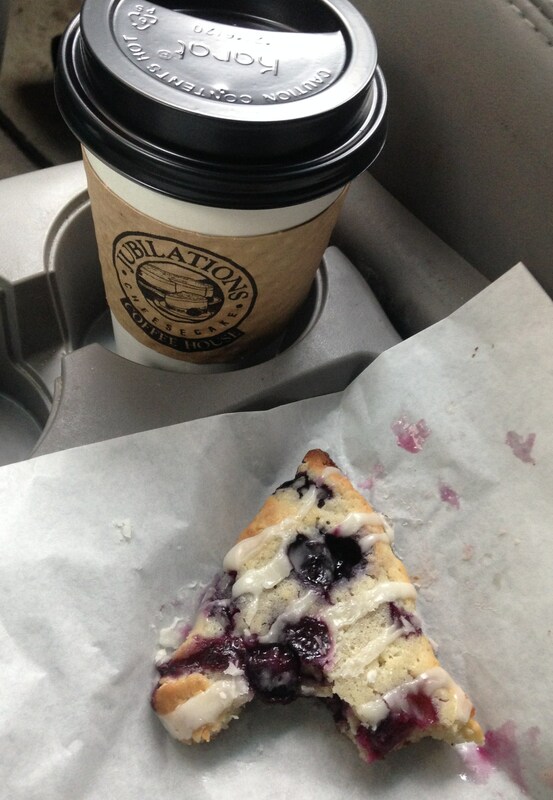 The first time I stopped, I got a blueberry scone, some coffee, and a sample of a granola bar. The scone was thin, packed with plump, juicy blueberries, and drizzled with glaze. It was so good, in fact, that I was not disappointed the next time I stopped in to find it was the flavor of the day again, despite my inner need for variety. The scone would not wait for the camera. Yes. It’s the scone’s fault. That second visit to Jubilations was more intentional. I was on my way to Florence, Alabama, and the nice lady in my GPS told me I should go through Columbus. But my inner voice (the Gastrointestinal Positioning System) overruled and sent me back through West Point. As I waited for them to bag up my scone and full-size granola bar (with not a trace of coconut, as the good Lord intended, thank you very much), I discovered the red velvet cheesecake – a layer of red velvet cake on the bottom, cheesecake in the middle, and cream cheese icing on top. I know what I want to get next time I’m there. Even if it is for breakfast. The ginormous granola bar turned out to be quite a practical buy. I nibbled a little on it on the way to Florence, but didn’t want to ruin my appetite because I knew my buddies there would feed me well. On the way back, however, my luck was not as good. My final stop was at Jay’s Country Squire restaurant in Sulligent, Alabama. I have a special connection to Jay’s not just because of the excellent choice of name, and not just because it’s a good old-fashioned steak and catfish place. Jay’s is where I learned to be careful with certain artificial sweeteners. Some friends took us there for dinner when we visited them in Sulligent a few years back. For dessert, I got a piece of sugar-free peanut butter pie. 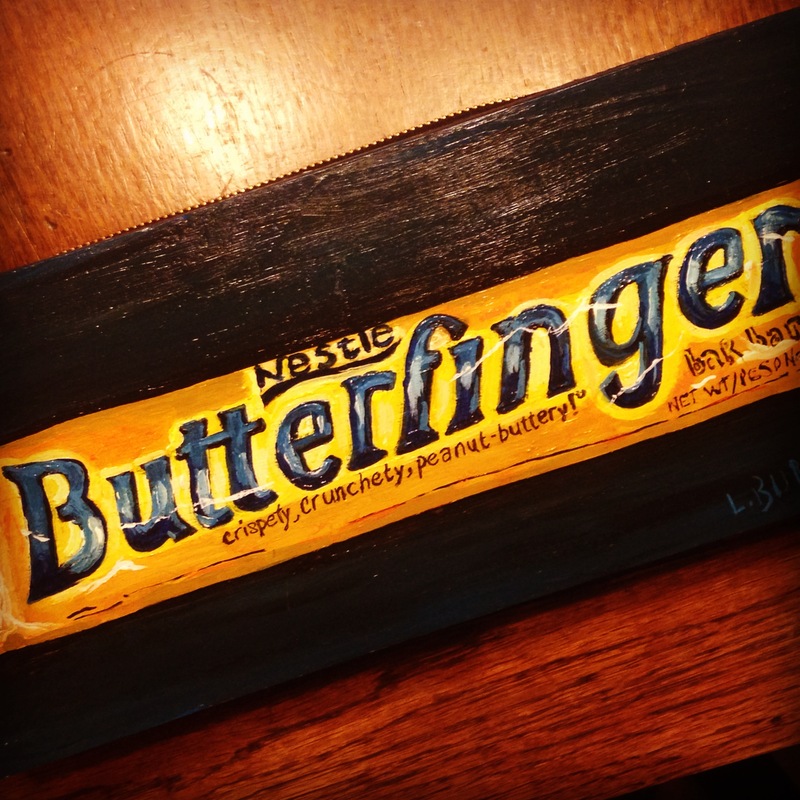 I am a real sucker for anything peanut-buttery (I bought The Wife a painting of a Butterfinger bar for Mother’s Day), and it was really good. I asked the nice waitress how they managed it and she named the artificial sweetener that was used. We finished dinner, went back to the B&B, and got ready for the next morning. When I woke up, I had a tummy ache. This was terribly inconvenient as we were about to speak to a large group of people, but somehow it all worked out. I guess it could have been another ingredient in the pie that was the troublemaker, or perhaps the volume of steak, catfish, and all the trimmings I ate before the desserts ever came. But since then I’ve been careful to limit my artificial sweetener intake. Just in case. The Wife loves her Butterfingers. I’m not sure this helps, but we like it. On the more recent trip, Jay’s was my last hope for a memorable dinner before I got back home, but it was getting late, and I didn’t think it would be a good idea to order a plate of catfish to go, wait for it, then eat it even later. Peanut butter pie or not, I knew I would not feel good in the morning. (This is why I am not five hundred pounds, for those of you who wonder. Occasionally, I make a good decision.) So I ate the granola bar. And as I said, it was a pretty big one, wrapped tightly in cellophane, which was a great idea because it was a bit on the crumbly side. It curbed my hunger and I declared it healthy. I’ll have to visit Jay again another time. Speaking of peanut butter (apparently these thoughts are more connected than I anticipated) I know a lot of you are looking forward to the summer months – and for the most part, I am, too. But it’s once again that season of year when there are no special shapes of Reese’s on the horizon in the foreseeable future – the usual drought between Easter and Halloween. It’s even harder this year because at Easter I discovered the Reester Bunny, in milk and white chocolate. This Bunny, if you didn’t have the pleasure, was smaller than your average chocolate rabbit, and I think the chocolate (or peanut butter, or both) was a bit sweeter. Either that or the chocolate to peanut butter ratio was drastically heavier on the chocolate side. Whatever it was, I liked them very much. Thank you, Reester Bunny. And darn you, Reester Bunny. My only hope now is to find a Reese’s Football at a fall away game where Daughter is cheering, as I did last year. I’m pretty sure that it was a re-wrapped fun-sized Reese’s Egg, but of course I didn’t care.